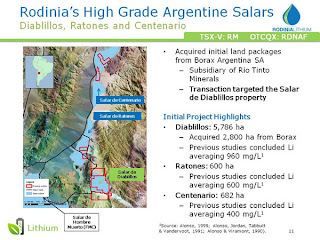 Toronto, Canada, October 16, 2012: Rodinia Lithium Inc. (TSX-V: RM; OTCQX: RDNAF) successfully produced lithium carbonate from the concentrated brine derived from the pilot ponds installed at its Diablillos property, located in Salta, Argentina. This first batch of lithium carbonate achieved a purity of 99.45% Li2CO3, and can be further washed employing the same methods to 99.75% Li2CO3. The process employed during the production of lithium carbonate is approximately the same as described in the Company’s Preliminary Economic Assessment (“PEA”) filed on SEDAR at www.sedar.com. The brine was concentrated and treated on site at the Salar and then shipped to SGS Laboratories in Lakefield, ON. The brine was then processed to prioritize lithium carbonate production following the flow sheet described in the PEA. Further batches of concentrated brine derived from the pilot ponds will be available for further processing prior to completing a full cycle at pilot scale in the first quarter of 2013. Completion of the pilot plant cycle is expected during the first quarter of 2013 and is expected to be the final component of the upcoming Feasibility Study. Rodinia Lithium Inc. is a Canadian mineral exploration and development company with a primary focus on Lithium exploration and development in North and South America. The Company is also actively exploring the commercialization of a significant Potash co-product that is expected to be recoverable through the lithium harvesting process. 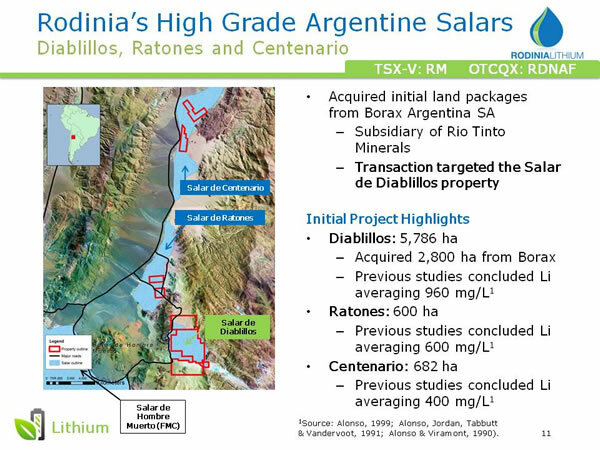 Rodinia’s Salar de Diablillos lithium-brine project in Salta, Argentina, contains a recoverable resource of 2.82 million tonnes lithium carbonate equivalent and 11.27 million tonnes potassium chloride equivalent. The project contains a recoverable inferred resource of 952,553,000 m3 grading 556 mg/L lithium and 6,206 mg/L potassium. Throughout 2012, Rodinia will focus on continuing to develop the Diablillos project by completing additional drilling and advancing through feasibility study. The Company also holds 100% mineral rights to approximately 15,000 acres in Nevada’s lithium-rich Clayton Valley in Esmeralda County, and is currently in the process of assessing the size, quality and processing alternatives of this deposit. The Clayton Valley project is located in the only known lithium-brine bearing salt lake in North America, and looks to represent the only new source for domestic lithium carbonate supply. The Projects are supervised by Ray Spanjers, Rodinia’s Manager of Exploration. Mr. Spanjers is considered a Qualified Person, as defined by National Instrument 43‐101 and has reviewed and approved the scientific and technical information contained in this press release. Please visit the Company’s web site at www.rodinialithium.com or write us at info@rodinialithium.com. Except for statements of historical fact contained herein, the information in this press release constitutes “forward-looking information” within the meaning of Canadian securities law. Such forward-looking information may be identified by words such as “plans”, “proposes”, “estimates”, “intends”, “expects”, “believes”, “may”, “will” and include without limitation, statements regarding the anticipated effects of the results and the impact of such results upon the PEA, the timing with respect to future results, timing with respect to the completion of the PEA; the potential of the Diablillos property; the potential results and timetable for further exploration with respect to the Clayton Valley project and the Diablillos property, the timetable with respect to future acquisitions and exploration developments at Clayton Valley and Diablillos, timetable for further exploration, analysis and development, title disputes or claims; and governmental approvals and regulation. There can be no assurance that such statements will prove to be accurate; actual results and future events could differ materially from such statements. Factors that could cause actual results to differ materially include, among others, metal prices, competition, financing risks, acquisition risks, risks inherent in the mining industry, and regulatory risks. Most of these factors are outside the control of the Company. Investors are cautioned not to put undue reliance on forward-looking information. Except as otherwise required by applicable securities statutes or regulation, the Company expressly disclaims any intent or obligation to update publicly forward-looking information, whether as a result of new information, future events or otherwise.